Our lovely concept artist Hue gave you a bit of a taste of what’s to come for Everend in his last blog post, and Logan told you about all of the awesome things you can do and how you can explore our game–but an important question remains: who? 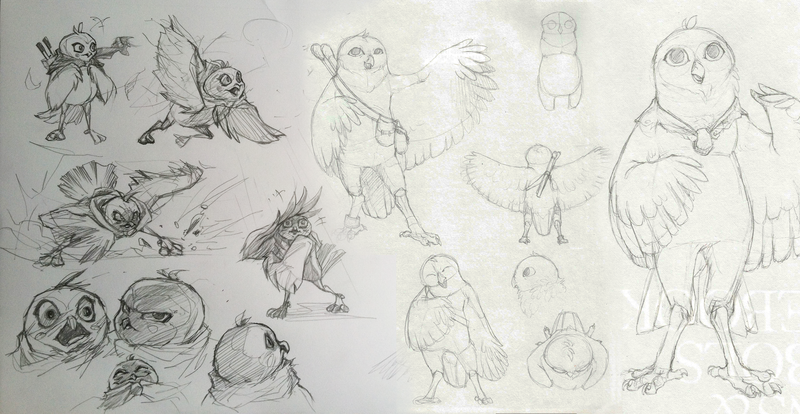 As I’m sure you’ve come to gather from our URL, the title of this blog post, and concept art to date, the main protagonist of our game is an owl. No shocker there, but there’s much more for us to consider as designers about our character even once we have chosen a species. I hope that this blog post will provide you with some insight to our decision making process in developing the physical and mental design of our fluffy main character. The first step in our character creation process was figuring out what type of anatomy we wanted to use. Owls might not seem like very complicated creatures but there is a very wide variety in anatomy, color, and size among their species. 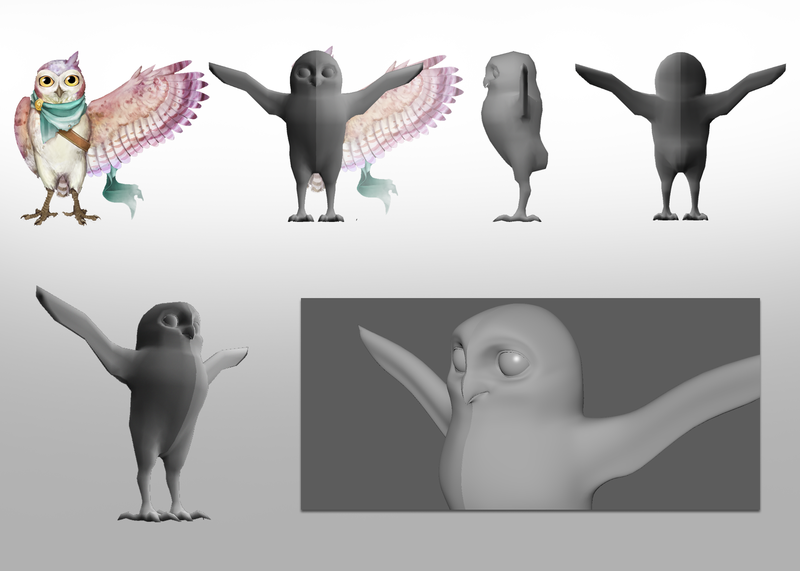 We knew early on we wanted our character to communicate a ‘young’ or ‘bouncy’ feeling, so we decided to model our protagonist after a burrowing owl. It just made sense that a burrowing owl would belong underground; as an added plus they are among some of the most expressive and tiny of their species. After deciding this, we set off on some preliminary ideating and sketch work. Sketches by Hue Vang and Emily Dillhunt. We learned a few things from our first round of sketches. We liked larger eye on our character, to help communicate a sense of youth and innocence, we liked a rounder, larger head with a short neck, and we preferred an owl that was more pear shaped with long thin legs. We also gave some thought to the character’s wings and how a feathered, fingerless arm might hold a torch, as well as tried out a few different accessories. As you’ll see in later revisions, the scarf stuck–as a team we liked how it added movement and flow to our character, and was also a nice way to sneak in some contrast in texture, material, and color. Knowing what we did from our first round of rough sketches, we moved on to some more formal concepting. For the start of Round 2, we put our focus on finalizing the character’s anatomy, constructing a simple outfit for our protagonist, and we started to do some rough work with color. Taking what we knew worked from previous sketches our character became more compact with a round head and heart-shaped face. 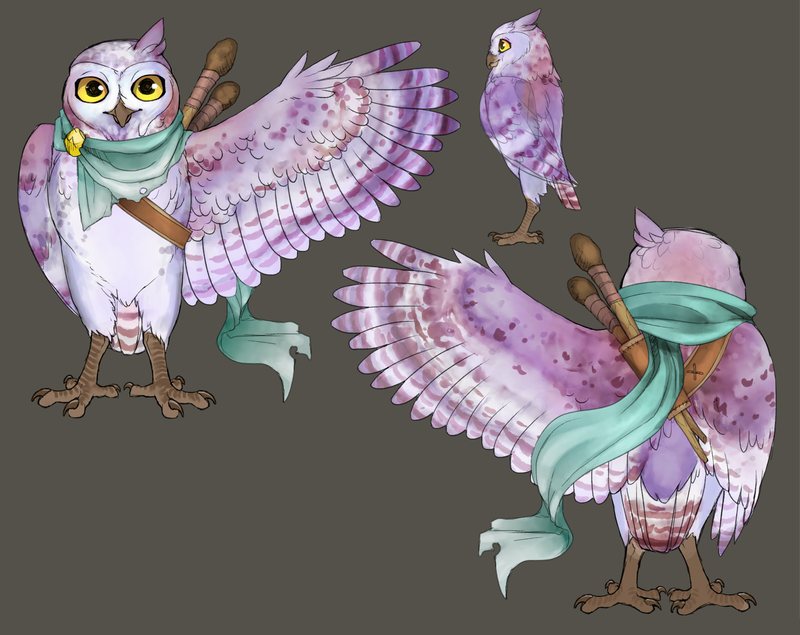 While not true to real owl anatomy, we drew in smaller, shorter feathers to act as ‘fingers’, so that our character could hold a torch with their wing and not have to hop around on one foot when it was active. Our character’s outfit developed into a ragged scarf and simple leather bandolier for carrying torches when not in use. The next step was color. Everend has strong blue and green hues throughout, so we played with very warm colors to pull our character off of the environment and make them stand out. 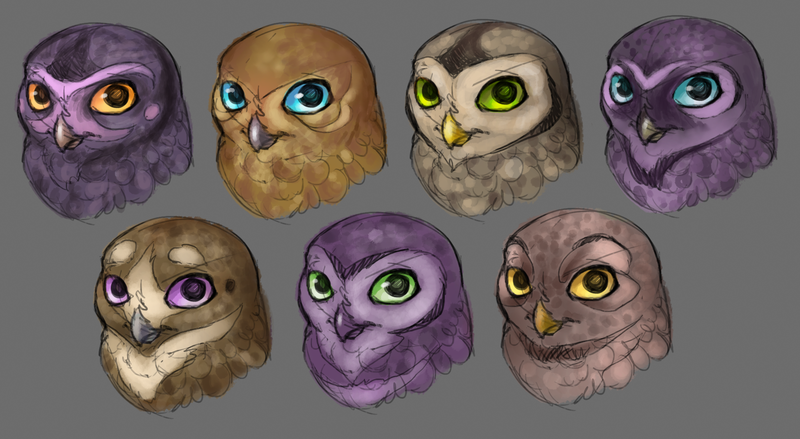 Owl head color and pattern studies by Emily Dillhunt. 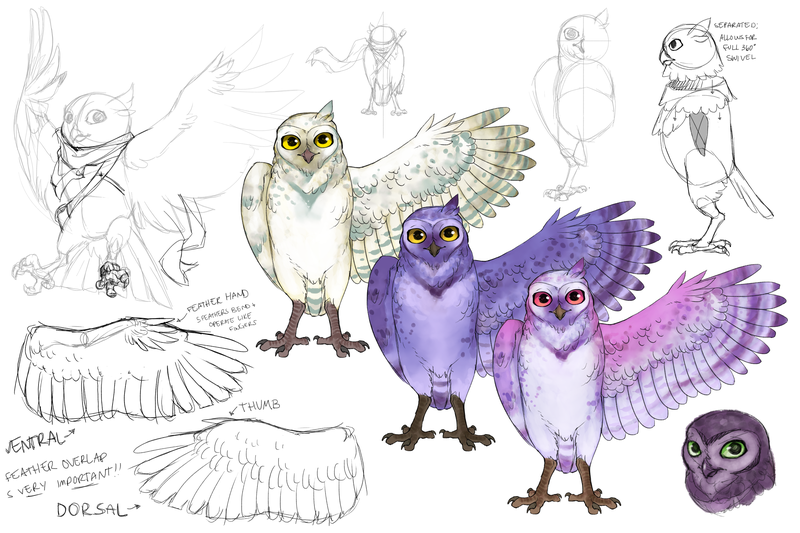 Pictured: three early palette considerations for Kaia the owl. Concept sketches by Emily Dillhunt. Round 3 was largely about small tweaks and edits to make Kaia perfect. Up unto this point no one had mentioned anything about gender for our character, but we liked the name ‘Kya’–it sounded very wild and predatory, almost like the call a hawk or other raptor would make. This was not very fitting for our character concept however, so one day when a team member spelled it wrong on accident as ‘Kaia’ the more feminine, softer looking form of the name stuck. 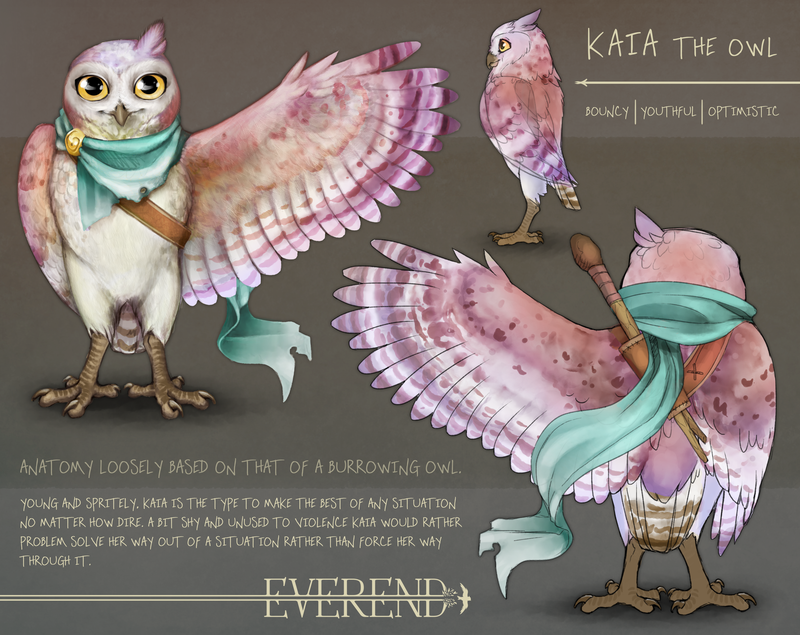 Kaia’s near-finished character sheet. Art by Emily Dillhunt. Having decided that Kaia our main character would be an optimistic, young female protagonist we went about making the final edits to her character. Kaia’s head got bigger, to make her appear younger and less predatory and drive home her innocent, spritely appearance, and then we moved on to making the final decision for her color palette. In the end we settled on a combination of all of the colors we had been considering, making her somewhat sunset or dawn colored. I personally like to think this choice was kind of poetic and fitting of her daunting journey–similar to the Egyptian sun god Ra who would travel into the underworld each evening and emerge victorious each morning as the rising sun to light the world, Kaia too is making a rather dangerous journey underground trying her best to reach the surface again. The final Kaia. Art by Emily Dillhunt. Kaia’s well on her way through another journey–the journey into 3D! She can’t wait to see you soon when you play Everend. Kaia model by Hue Vang.